House Renovations on a Budget. It’s the easiest thing in the world to ignore things in our homes when they begin to start looking a little tired and drab. Our homes should be places that we can relax, unwind and simply get ourselves back into the right frame of mind to move on with the next days, weeks and months of our lives. It would be fantastic if we could sit in the middle of luxurious surroundings and gorgeously sumptuous carpets to sink our toes into, but we can’t all have those privileges. As lucky as we are to have a nice house and a family to fill it, there are things that I would like to change about it. I can’t see it happening until the kids leave home, and that’s not likely to happen any time soon. I love my kitchen, which I did on a budget by buying all the pieces separately on the Internet and getting them sent to me. It already needs a freshen up and a repaint and I regret not getting my granite backsplash higher up the wall, but I’m stuck with it now. I have two of these blinds in my kitchen and they were £28 each from B&Q. They look much more expensive. I know I am lucky to have a decent kitchen to make food for my family with, and shopping around was the only way we could afford to do it. As usual, labour costs tend to make things very expensive, but it’s also worth shopping around for those too. Our homes are the biggest expense that we are ever likely to make, and doing the maintenance is important to get them to increase in value, or even just maintain its value, depending on where we live. In reality, there is always something to change, fix, repair or replace as our tastes change and develop and home improvements can cost a bomb. To keep home maintenance to a premium, so many of us forget to keep things like our gutters cleaned out or drains clear and they are always worth doing to stop future problems further down the line. There are ways we can look for savings to help us with our renovation needs, whether we need to call in professionals or not. I did my front lounge on a budget last year and was so pleased how it came out. I just have to move onto some more rooms one by one. There are lots of them. Some brands carry them and entering is usually quite easy. If one comes to your area, it’s worth going. Some brands might carry giveaways or have some good tips to help change your home on a budget. 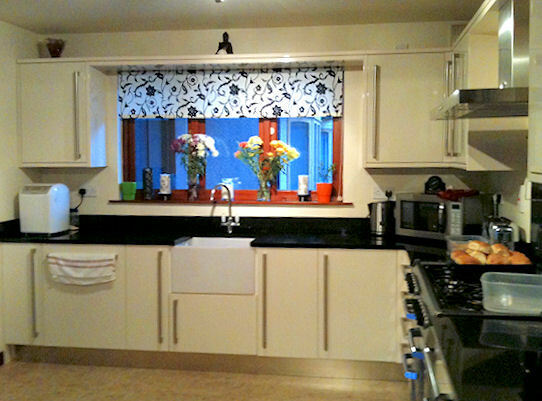 When I got my granite worktops, I had mine priced by kitchen and DIY companies locally, then went on and got them for less than half that price from a company in England who came up and fitted them bespoke. It was well worth it. If I plan to buy any furniture, I always plan to buy just after New Year. It’s amazing the savings and offers that come up on the 1st of January. When we bought the suite in our family room, it fluctuated between £1600 – £1800 the four times we went to look at it, but on the 1st January, we got the same thing which was a corner suite with two reclining chairs, an extra TV unit and an extra chair for £1200. The wait was well worth it. There are things you can do on a budget. I rarely have anyone come in to do any painting for us. Maybe that’s why the whole house is now in need of a refresh from top to bottom, but I will get there in the end. I’m a bit of an all thumbs person when it comes to making things for soft furnishings like curtains, blinds and cushions, but some people find they have the equivalent of green fingers once they start. If you don’t try, you’ll never know. I love this and I am constantly saying you don’t have to spend a fortune to redecorate or renovate. I even made money on revamping my living room which was a bonus.